Universal Mesh Banners provides a wind/air flow release of up to 40% reducing the load on structures and fittings. Universal Banner Mesh is suitable and widely used for: Large format advertisements, Scaffolding, Theatrical & TV backdrops, Hanging displays and where both weight or wind are concerned. 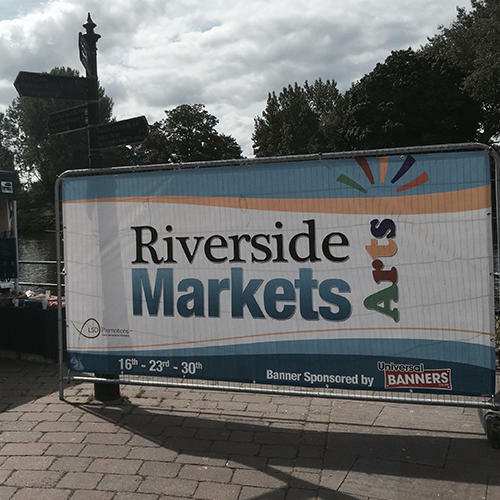 Our Universal Mesh banners can offer enhanced image compared to traditional meshes. The premium 270gsm custom printed PVC Banner material are designed for cost effective long term use. High wind Mesh printed banners work all day everyday. Their low cost makes them suitable for all budgets. Mesh Banners are especially effective in high wind locations due to having multiple small holes in the fabric. This also makes them half the weight of the equivalent PVC banner which can help when fitting very large banners and reduces strain on the fixings securing them. Banner eyelets are normally fitted every two feet to keep the mesh banner material flat and secure against the elements. Should you wish to have a different finish please let our team know. When its comes to fitting scrim banners to brick walls or wooden fences we suggest simply using steel penny washers with wall plugs and screws for brick walls or self-taping screws on fences.